First Line: I suppose it all began with the garden. In 1890, the first diplomatic delegation from Japan arrives in London, and Cyrus Barker's beautiful, tranquil Japanese garden has been chosen to show these very important guests. Later that same night, Ambassador Toda is shot and killed in his office, and Cyrus Barker is found across the street in possession of a gun with one spent cartridge. He's immediately arrested by the Special Branch for the murder and brutally interrogated for hours until his assistant, Thomas Llewelyn, brings Barker's lawyer and manages to obtain his employer's release. While the British are still convinced that Barker is the killer, the new Japanese ambassador hires him to find the real murderer. This investigation will lead Barker and Llewelyn deep into London's underworld...and deep into Barker's own mysterious past. Will Thomas's historical mystery series is one that I've been following with pleasure since the very first book, Some Danger Involved. My pleasure is mainly due to the voice of Thomas Llewelyn, who begins as a complete novice to the private enquiry business and gradually becomes quite skilled, thanks to the tutelage of Cyrus Barker. Barker has always been a rather shadowy character, and tiny bits and pieces of his past have to be wrenched out of him, so it was good to see more information was forthcoming in Old Scores. Thomas knows how to construct a plot that keeps readers guessing, and his action scenes keep the pace moving right along. I always feel as though I'm walking the streets of the seamier parts of London when I read a Barker and Llewelyn mystery, but I know I'm in safe hands with these two men. 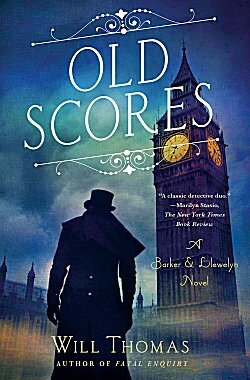 If you like strong mysteries that take place in Victorian London, I think you'll find Thomas's series a perfect fit. I like the way Thomas portrays London in this series, too, Cathy. And I do like the 'back and forth' between Llewelyn and Barker. Glad you enjoyed this. Yes, the dialogue between the two main characters is very good, and I really like how Thomas has grown throughout the series.